Big laughs come in one small package when four uproariously hilarious episodes from America’s #1 TV family The Simpsons arrive in a special collection release. 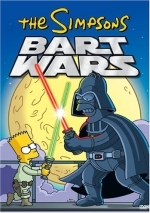 Bart Wars features four episodes that reference the Star Wars franchise. In between the steady release of Simpsons full season sets, Fox has been putting out compilations of related episodes. Some make plenty of sense, like the Halloween and Christmas packages. And then there’s Bart Wars, an odd conglomeration. 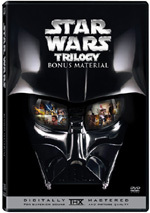 Based on the cover art, one might expect that each of the four episodes connected to Star Wars in some way. The package shows Bart as Luke Skywalker, Homer as Darth Vader, Lisa as Leia, Marge as Obi-Wan Kenobi, and Maggie as Yoda. However, that’s not the case, as we very little to do with Star Wars in this set. I’ll discuss the disc’s potential theme at the end of this review. For now, let’s get to the shows themselves. I’ll present story synopses straight from the DVD’s package and also offer my own thoughts on each program. From top to bottom, “Death” offers a terrific program. It launches DVD Four with a genuinely memorable show. From the cracks about the lottery and public hysteria that open the program to the calamities that befall the family when SLH gets sick to the bizarre escapades that greet the pooch when he flees, “Death” provides a hilarious piece. SLH-oriented shows seem to always work well – like Season Two’s “Bart’s Dog Gets an ‘F’” – and this one’s excellent. It even presents the funniest Clockwork Orange parody I’ve ever seen. Despite being one of the sappier episodes at times, “Proud” still packs some terrific laughs. I about lost it when we got Homer’s drawing of a robot grilling a hot dog - it’s funnier if you see it - and Lawrence Tierney’s guest turn as the store detective adds hilarious grit to the show. It doesn’t fall into the “classic” category, but it offers more than enough entertainment to satisfy. The Secret War of Lisa Simpson (aired May 18, 1997): “Bart joins an all-male military school - as does Lisa. Her gift is tested more than it ever has been, particularly when she must survive an obstacle course known as ‘The Eliminator’”. “War” starts strong, especially when Chief Wiggum gives the fourth graders a tour of the station; I’ll have to adopt “California cheeseburger” as a pet phrase. However, despite the abundance of opportunities for humor at the military school, the show doesn’t exploit a lot of them. The rest of the episode mostly plods and lacks a lot of amusement. It entertains fitfully but not enough to turn into anything above average. The convention allows plenty of allusions to the Star Wars movies along with other science-fiction icons. 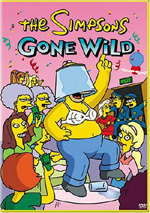 The show mined similar territory with comic book conventions, but that’s only a minor aspect of the episode, as it focuses primarily on Homer’s adventures. The show doesn’t quite become inspired, but it offers some decent entertainment. ”Mob” is the only episode with any real connection to Star Wars. Obviously the presence of Hamill leads to most of the tie-ins, and the rest come from the convention. If Bart Wars meant to be a collection of Star Wars-related shows, it’d fit. How does it tie to the other three shows? It doesn’t. Honestly, there’s no apparent rhyme or reason to the selection of episodes on Bart Wars. For a moment, I thought maybe these were supposed to be shows related to Bart being really, really bad; he certainly acts poorly in “War” and “Proud”. However, he does nothing wrong in the other two episodes. He plays only a minor role in “Mob” and actually behaves in his most altruistic mode in “Dog”, as he works selflessly to help Santa’s Little Helper. So what’s the point of this collection? Other than to provide a pun of a title and some cute package art, I have no idea. There’s no logic behind the inclusion of most of the episodes, and some of them seem badly out of place. For instance, the two Simpsons Christmas DVDs present shows related to winter but not the holiday itself. Why isn’t “Proud” on one of those discs? Are monkeys running Fox? Could be. Bart Wars offers entertainment but makes no sense as a themed collection of programs. 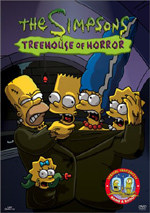 Bart Wars appears in an aspect ratio of 1.33:1 on this single-sided, double-layered DVD; due to those dimensions, the image has not been enhanced for 16X9 televisions. The shows covered a wide span of years and varied due to those factors. This produced a mix of highs and lows, but the programs remained consistently watchable. Sharpness varied. Much of the time the shows were reasonably distinct and detailed, but more than a few soft spots occurred. The programs never became grossly undefined, but they occasionally seemed somewhat bland in that department. Jagged edges and shimmering popped up sporadically but didn’t cause any real problems, and I also observed no issues connected to edge enhancement. Source flaws were a more significant concern, at least during the early shows. A few examples of specks and marks showed up throughout some of the programs. Matters improve during the newer “Mob”, at least. Colors looked fairly erratic as well. The newer shows demonstrated reasonably vivid and concise hues, as “Mob” again led the field. For the older shows, the tones lacked much vividness and sometimes came across as somewhat runny and messy. Much of the time the hues were acceptable, but they didn’t betray a great deal of life some of the time. Yellows for the characters’ skin seemed particularly anemic. Black levels were moderately flat and mediocre, while shadows seemed a bit too murky and opaque. Overall, the shows were watchable but unspectacular, and they need the clean-up work that made the season sets more attractive. While the full-season sets of The Simpsons feature Dolby Digital 5.1 audio, the shows on Bart Wars included only the original Dolby Surround 2.0 tracks. Since the 5.1 mixes haven’t exactly set the world afire, I thought the 2.0 audio seemed quite sufficient. The soundfields appeared a little more aggressive than what I heard during the various full season sets. Not that they went hog-wild, but they used the sides more often for movement and effects, and the surrounds kicked in more frequently as well. Elements might go from front to rear, and the back speakers contributed a better than expected sense of place. The whole package tied together well and seemed like a fairly vibrant expression of environment. Audio quality also was good, though speech seemed somewhat weaker than expected. Most of the dialogue remained nicely natural and distinct, but a surprising amount of edginess crept into the mix. Effects were clean and accurate, and they showed quite nice bass response. Music also sounded pretty well defined and detailed, and the score demonstrated good dynamics. Were it not for the edginess to some speech, the mix would have earned a slightly higher grade, but as it stood, Wars got a pretty solid “B-”. The bargain-priced Bart Wars includes only one supplement, but it’s a decent one. For “Mayored to the Mob - Act 1”, we get an Animation Showcase. This allows us to use the “angle” feature to check out some scenes at different levels of completion. We can flip between storyboards, animatics and the finished product. The seven-minute and 44-second animatic also appears on its own. It’s a fairly fun interactive way to check out the stages of completion. If you can get past the nonsensical lack of theme for this package, The Simpsons: Bart Wars offers a good collection of episodes. The four shows range from decent to excellent, and I found some absolutely hysterical moments here. I’m not an easy laugh, but a few bits had me going for extended periods. The DVD presents pretty average picture and audio with one fun extra. As much as I love The Simpsons, though, I find it tough to recommend Bart Wars wholeheartedly. Fans who own the Season Three DVD set will already own one of the episodes. It’ll take a while for us to get to any of the other three shows, though who knows exactly how long it’ll be. As of April 30 2005, Season Six will be out soon, and the remaining programs come from Seasons Seven, Eight and Ten, respectively. We might expect Seasons Seven and Eight within a year after Season Six, though I suspect we won’t see Season Ten until 2007 at the earliest. If you can wait, do so, as this isn’t a killer collection. However, for $15, it’s not a bad set for completists or those who just want a good sampler of shows.